Professionally installed Solar Pool Heating panels are an investment, and most people want to know how long Solar Pool Heating panels last. That’s a great question! Solar Pool Heating Panels last a long time! Most major manufacturers provide a 10-12 year collector (panel) warranty that covers manufacturer defects. That shows you how confident the manufacturers are in the quality and longevity of a typical solar pool heating panel. Considering that over 100 million gallons of water can pass through a typical solar pool heating system in its lifetime, it truly is amazing how well solar panels stand up to the rigors of pressure, chemicals, sunlight, wind, and all of the other elements that affect them. A different questions is how long can solar pool heating panels last? Because the industry is fairly mature, at least a couple of manufacturers have been around for decades. That means there are millions of panels out on roofs, and we get to see quite a few really old solar panels. Even in hurricane ravaged Southwest Florida, we still see panels from the late 1970’s and 1980’s without any major problems. Just yesterday we came across a 1987 system in pristine condition. 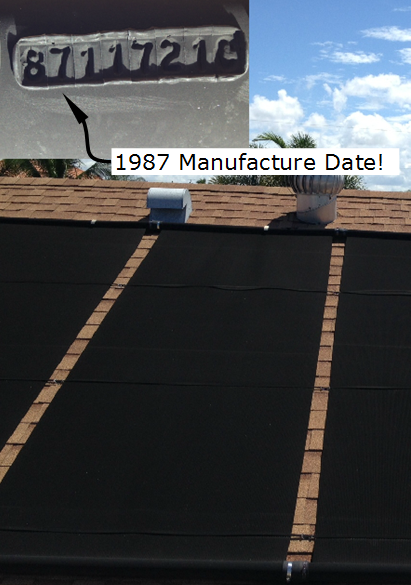 The technician was on the roof installing a new solar tubular skylight when he noticed the aging but operational system. He joked that he was just six years old when the system was installed! Because there are so many factors that go into the longevity of a solar pool heating system, it is hard to say how long any particular system will last, but to assume a system will last somewhere between the manufacturer’s warranty and 25 years would surely convince most that they will get their money’s worth.